and everybody speaks in Turkey. Many Turks in the major cities and tourist areas speak English, German or French. Kurdish is spoken in the southeast where some of Kurds reside. Arabic speakers can be found in the 'Hatay' province bordering Syria. German is the most common second language, a legacy of the millions of guest workers Turkey sent to West Germany in the 1970s. Meanwhile Istanbul's Kapalicarsi (The Grand Bazaar) is a unique place that, you can meet vendors, whos speaks almost all of the world languages. Believe us, this is true! they love to read the future, through shapes that coffee powder itself forms, at the bottom of the cup(fincan). Modern REPUBLIC OF TURKEY declared on 29 October 1923 under the leadership of Mustafa Kemal (1881-1938), called Ataturk--the 'FATHER TURK'. The creation of the new republic in the heartland of the old Islamic empire was achieved in the face of internal traditionalist opposition and foreign intervention. Ataturk's goal was to build on the ruins of Ottoman Turkey a new country and society patterned directly on Western Europe. He equated Westernization with the introduction of technology, the modernization of administration, and the evolution of democratic institutions. TURKEY is a shoppers' paradise ! One of the great delights of any visit to Turkey is shopping. The rich variety of Turkish crafts such as its world famous carpets (kilims), brilliant hand-painted ceramics, copper and brassware, or meerschaum pipes make it almost impossible to not buy these charming souvenirs. Equally enticing are the relatively inexpensive leather and suede goods which are of excellent quality. Btw; keep in mind that, bargaining is part of Turkey's entrepreneurial culture(except in restaurants), and polite negotiation should not offend any shopkeeper or hotel owner. Istanbul's famous bazaar quarter stretches from the famous GRAND or COVERED BAZAAR 'Kapali Carsi' in Turkish, (kah-pah-luh chahr-shuh) in BEYAZIT district down to the SPICE BAZAAR> ('Misir Carsisi' in Turkish)... near the GALATA BRIDGE('Galata koprusu') in EMINONU district. Every day thousand of tourists from all over the world and local people shop in these historical market places. _ _ _ _ _ _ _ without a trip to GRAND BAAZAR ! Grand Baazar is a huge enterprise covering 30 hectares (75 acres) and encompassing over 60 streets. 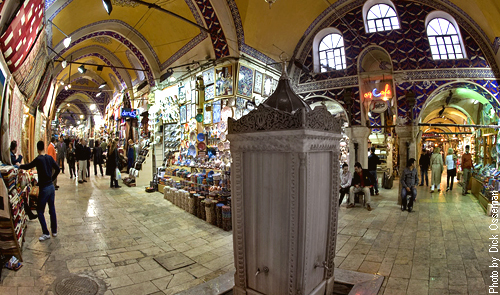 Everything you can imagine is available in the bazaar's more than 4000 shops. Whether you are looking for antiques, leather goods, furs, glass, brassware, gold, silver, furniture, carpets (kilims), or electronics, you will find it there. Moreover, it even incorporates two mosques and a wide variety of eateries and coffee shops. Grand Baazar is the place that you will not want to leave. Time wise, plan to spend at least two days in this 'shopper's dream world'. 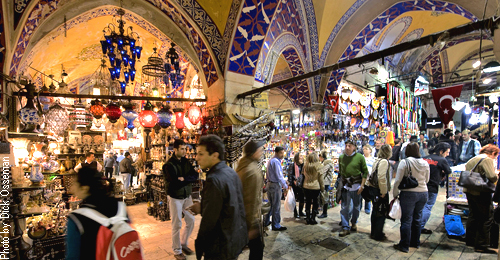 With more than 4000 shops the Grand Bazaar is a shopper's wonderland. C'mon ! DISCOVER THE GRAND BAZAAR YOURSELF ! For more on Kapalicarsi, see our 'Istanbul page! DO YOU NEED A HOTEL in Istanbul? All Turks enjoy keeping this blue-and-white Evil-Eye charm NAZAR BONCUGU or MASALLAH, in Turkish (see picture left). These traditional ornaments come in all sizes and shapes. They are usually made of glass but now they are also available in plastic for use in such as items as key rings, pins, bracelets, necklaces, TESBIH and home wall ornaments as well as Evil Eye gift gift items and decorations. . The evil-eye charms are NOT a religious items and you can see them and buy one almost in everywhere. Turks believe; if you wear one or hang one in some place in your car, home and business, any one who has bad thought or feeling towards you will have the thoughts reflected back to themselves. Most Turks hang a small evil eye amulet on the rear view mirror of their car and always attach to newborn baby's or children's clothes. . It is believed that if your Evil Eye amulet cracks or breaks, it has done its job and should be replaced! Turkish people use unique body language as follows. Most of the Turks indicate 'YES' (EVET, in TUrkish) by nodding the head up and down. To say NO (HAYIR, in Turkish) they nod their head up and back, while lifting their eyebrows at the same time. Or they just raise their eyebrows, means NO. For example, when a Turk got an offer for something to eat, first being in polite, he or she will say you Thank you (TESEKKUR EDERIM, in Turkish). While he or she mostly nods head... without giving you in correct way a complete answer by saying 'yes' or 'no'. So, the meaning of the conversation can be understood by his or her head's movement and a warm smile. Again, if head get nods up and down, this means usually 'yes', but if head get nods up and back, that means 'No'. The origins of 'Yagli Gures' (oiled wrestling) are lost in legend, but Kirkpinar's ('Forty springs' in Turkish) championships are still held on the outskirts of EDIRNE, on the western side of the country... almost on border with Bulgaria. Hundreds of amateur wrestlers from all over the country gather in early July at 'Sarayici' distric of Edirne city. The wrestlers wear a special sort of breeches made of buffalo leather called 'Kispet' and which are tightened around the waist and legs. To make the contest more difficult, the wrestlers smear their bodies with oil, making it difficult for their opponent to hold onto them. According to the legend, wrestling competitions were held to honor the Sultan who was visiting the area. Forty men wrestled. Not one of them yielded until morning came when they all fell from exhaustion and died. Suddenly forty springs sprang from the ground where they had fallen and the Sultan, moved by this scene, ordered that from that time on all the 'Yagli Gures' matches would be held at KIRKPINAR each year in honor of the forty men who would not be defeated in front of their Sultan. In Sept 2010, in the Greco-Roman category of the Wrestling World Championship, a 74-kilogram (163-pound) Turkish wrestler SELCUK CEBI captured a gold medal defending his title in Moscow, Russia. Greco-Roman wrestlers RIZA KAYAAL won Gold Metal at 2012 London Olympics. ASLI CAKIR won Gold Metal with women's 1500m at 2012 London Olympics. and helloTURKEY.net, a part of your travel plans soon! Please bookmark this website and visit again. Turkey although in many respects is a modern country, but still conservative and the values of Islam are widely respected. Very informal or revealing clothing can be seen as disrespectful, especially in small towns. So, please dress accordingly when you visit Turkey. Those people going to Turkey from the United States need to pack power plug adapters for both two and three prong American plugs, and should probably also pack a small transformer rated for the electrical equipment they are taking with them. The electrical current is 220 volts, 50 cycle's alternating current (AC) all around Turkey. Wall outlets take standard round continental type plugs. Turks are notorious sugar lovers and the the heavier sweets and pastry are custom unto themselves. The origin of Turkish Delight dates back to the time of the Ottoman Empire and until now LOKUM has been played an important role in Turkish hospitality. Lokum's main ingridences are: Flavors, sugar, powder sugar, corn starch, limon juise, cream of tartar, water, citric acid, rose water and food coloring oil. Gummy, sugar brushed cubes can be filled with anything from fruit flavoring to pistachios, walnuts, hazelnuts, coconut flakes, almonds , depending on your taste and budged. If you haven't try Turkish Delight yet, don't forget to try it when you visit Turkey and get some of them in gift boxes for your friends back at home! Kabobs known worldwide and available in almost any place in Turkey. Kabobs (KEBAP in Turkish) comes in many different flavors: although their primary ingredient was lamb, but not anymore(because lamb is very expensive now, not only in Turkey, all around the world). Now kabobs are mostly made now with beef, chicken, fish and grilled together with vegetables. ('Sis Kebap' in Turkish) are the traditional way of grilling cubes of meat... kind of cut that person can effort. Meat usually interspersed with same size of vegetables pieces, such as greenpepper, onion and sometimes with the others. KOFTE Kabob, call IZGARA KOFTE in Turkish and IZGARA means GRILLED. KOFTEs made in shape of flat meatballs or nicely hand shaped along around the skewer, as a whole piece. Kofte meat prepared with several spices plus, parsley, garlic, egg and small amount of inside part of the bread (addition of this part of the bread makes kofte softer). ADANA KABOB is the kabob that same as explained above and the only difference is, they are preety spicy and even sometimes too hot. Customer mostly asked by waitress how would like to have kabob, mild or hot. On the other side; Bursa's famous ISKENDER KABOB is sliced DONER KABOB by smothered in tomato sauce, hot butter and served with yogurt on site, plus diced pita bread (PIDE) under the kabob.